CN: Ernesto, besides Merckx’s hour record, what other exploits do you remember from your long career in cycling. 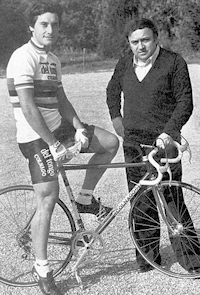 Albani went up to Merckx and asked him if he would wait for Peterson, but he was sceptical. ‘I hope he’ll pull if I wait for him.” So Merckx waited for Peterson, and for the rest of the stage, the Swede could pull only 20 percent of the time… Peterson won the stage and Merckx took the Maglia Rosa. With Merckx, there were so many times that he did something special. Remember that Wednesday I told you about in 1971 when Merckx came to my officina to pick up the three bicycles for the World Championship? I was also the Italian team mechanic at that time and we brought up all the bikes and Merckx’s spare bikes to Mendrisio, where the Worlds were. Saturday evening before the Worlds, I was at the Italian team hotel with Gimondi, Zilioli and the rest of the team. It was 830 at night and they called me to the telephone… it was Merckx. ‘Aren’t you coming up?’ he asked? I was really surprised and said ‘hey I’m here and how can I get up to Switzerland now!’ But Merckx insisted so I called up a friend of mine who had a motorcycle and he got me up there by all the back roads and the shortcuts so we avoided the traffic at the border. I was at Merckx’s hotel in Mendrisio by 10pm. The next morning in Mendrisio, I saw Merckx before the start. He wouldn’t look at me… I whistled at him but he still wouldn’t look at me. Then Merckx rode by me and growled, “I’ll kill them all” so I knew he was all right for the race. CN: Other than Merckx, there were other great riders that rode Colnago bicycles… like Gibi Baronchelli from your first sponsored team SCIC. 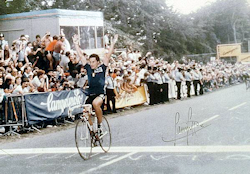 EC: In 1973, Baronchelli won the Tour de l’Avenir and the amateur Giro d’Italia. He is from this area and I knew him since he was a young rider… we knew that he was a strong rider and Molteni said to me ‘bring him to our team’, but he already had Merckx and Baronchelli would have just been his gregario. So that’s one reason I left Molteni; because I sent Baronchelli to SCIC and in fact, in 1974, Baronchelli was 2nd in the Giro d’Italia only 12″ behind Merckx. So he was a strong rider… he had a good career but could have done a lot more in cycling. CN: What kind of rider was Baronchelli? EC: He was a good guy; simple and he had a good character. He was usually relaxed and didn’t have to be babied. He had a lot of class and we thought he was destined to win the Giro d’Italia but he never did. 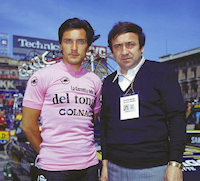 EC: Chicco, that’s what we called him… plus there were Galdos and Lasa on that team who were good riders. CN: How would you compare Chicco Fuente with the climbers of today? EC: Oh I’d say that Chicco was a rider who was kind of shortsighted. He couldn’t ride by a program but had to follow his impulses. His efforts wouldn’t go for two hours; he’d just give it all… boom! I remember in the 1974 Giro that Merckx won by 12″ over Baronchelli and Gimondi, there was one stage where Fuente took off from the start and attacked everybody on the first climb over Monte Grappa. But before the start, he was smoking a cigarette! You just don’t do that… he was an exuberant guy, but in cycling sometimes that’s not so great. Galdos was a very nice guy; I met him years later in Spain where he had opened a pizzeria. CN: As the era of Eddy Merckx was over, Giuseppe Saronni began to be noted among top Italian amateurs. When did he first come to your attention? EC: When he was 20 or so; at the time, he was known as a sprinter and had the build of a sprinter. Saronni was always an intelligent rider and he reminded me of the old-time rider Girardengo, who was so smart. Saronni wanted to turn pro and I said to him ‘but you don’t climb very well.’ Saronni said ‘no I’m a pretty good climber’ but I knew he had ridden the track so I wasn’t sure. Since Saronni was going to do the amateur race Giro Val d’Aosta. I said to him ‘lets see how you do there.’ So Saronni won the hardest climbing stage to show me that he deserved to turn pro so we brought him onto SCIC. Paolini, who had been Italian champion three times, was getting old so thought Saronni could fill his shoes. Once Renzo Tornari, the owner of SCIC saw Saronni for the first time he said ‘well he looks like a sprinter’ and told us to sign him for less money than we had promised. He underestimated Saronni, who went out in his first pro race in 1977, Trofeo Laigueglia and was second behind the world champion Freddy Maertens. His first pro race! Right away, you could see how good Saronni was. CN: Ernesto, you always had a good feeling with Giuseppe Saronni. How would you characterize him as a rider? EC: Oh that’s not important… I’ve always tried to help Saronni and that’s just about business. He’s almost like a son to me. CN: What’s the moment you cherish most in Giuseppe Saronni’s career? EC: There are so many… like his ’82 Giro di Lombardia and ’83 Milano-San Remo, both as World Champion. Those were special moments… then there was the 1982 Worlds Championships. His friend Chiapano had died a month before and Saronni didn’t even want to race. I said to him ‘go on, give it a try for Chiapano’ and so Saronni decided to race. Saronni was riding well all race, but in the final, we saw that the American rider Boyer had attacked and gotten a good gap. Kelly was there and so was the other American Le Mond. But when Saronni attacked in the final kilometer and I thought he was going to break his chain! Saronni speed was twice that of the others to win. It was the way Saronni expressed himself as a sportsman that got all of Italy behind him. The way Saronni had so much heart, that he would give it all to win. It’s hard to explain… Saronni was a rider who had the smarts; he had the legs and became a champion. And even today, Saronni is one of the only people I know who’s left in cycling who really knows how to run a team well.